The Oxypot Veg works in the same way as an Oxypot but the plants are closer together because they will be moved onto the Oxypot for the final stage of growth. The 1L mesh baskets hang down into the misting chamber whilst an air pump creates a constant stream of bubbles and an oxygen rich environment. The roots are constantly submerged in the oxygenated solution which develops stronger, healthier roots. 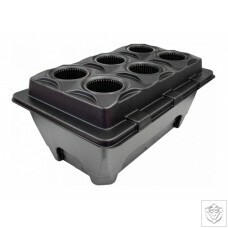 The Oxypot Vegging System makes it easy to transplant to an Oxypot, IWS system or pot, to complete the plant’s journey and develop an unbeatable crop. It's impossible to saturate plants in an Oxpot because the roots only take up what they need when they need it. Just keep the misting chamber topped-up and it's impossible to underwater because the solution is always available to the plants. Plant Spacing: 10cm between each pot.